October turned out to be a great month for the U.S. labor market with a whopping 250,000 jobs added, besting economists’ expectations and outpacing the 12-month average! While the unemployment rate held steady at 3.7 percent – the lowest we have seen since 1969 – over 700,000 Americans previously discouraged from seeking work entered the labor force, likely encouraged by record high job openings and the fact that wages have grown by 3.1 percent, the highest yet since the recession! With household incomes rising, consumer confidence has gone up to levels we haven’t seen in 18 years, driving increased consumer spending that will continue to feed the growth of businesses, hiring, and wages moving forward. The U.S. Department of Labor’s October Jobs Report gives us clear evidence that we are on the right track. Through our shared efforts to unburden the market from outdated and ineffective regulations and provide tax reform for the American people, this Congress and this President have helped to unleash the potential of the U.S. economy. We’re empowering state and local agencies to govern based on their expertise. We’re letting business owners run their own businesses how they see fit. We’re letting families make decisions for themselves on how best to live their lives without the federal government getting in the way. Month after month we are breaking records on almost every metric, and I couldn’t be prouder of what we have accomplished so far. With your voting card, I will continue to support these policies to ensure we have the strongest economy yet. When thinking about all the different industries that make our great state of Georgia stand out, the first few that come to mind are agribusiness, financial services, and entertainment, and while each industry certainly plays a crucial role in driving Georgia’s economic development and success, Georgia’s manufacturing industry plays a unique role as it is part of every economic sector. In fact, manufacturing in the state of Georgia accounted for 11 percent of the state’s gross product output in 2017, or more than $60 billion – a figure that surely impacts and supports many of our Seventh District friends and neighbors. While most of Georgia’s successes in the manufacturing sector stem from the business-friendly environment and phenomenal workforce that has been cultivated and supported by our state officials and lawmakers, there is much that can be done in Washington to build on the their success and to help put our manufacturing workers and companies on a level playing field with foreign competitors, and I am honored to be a recipient of this year’s Manufacturing Legislative Excellence Award for my role in doing just that in the 115th Congress. From cutting burdensome and unnecessary regulatory red tape to simplifying the tax code, this Congress has undeniably moved the needle forward in helping our manufacturers succeed. I am constantly hearing from manufacturers right here in the Seventh District about how Congress’s actions have propelled their businesses forward, so much so that the National Association of Manufacturer (NAM) doesn’t need to show me that their manufacturer’s quarterly outlook survey registered optimism at 93.9% -- the highest year average in history – to convince me that manufacturers across the nation are reaping the benefits of this Congress’s bold, pro-growth actions. To that end, I want to thank NAM for their hard work and partnership on behalf of our nation’s manufacturing companies and workers, and I certainly look forward to delivering more successes for these hard-working women and men! Back in March, the American Truck Dealers (ATD) presented their 2018 Truck Dealer of the Year award which recognizes commercial truck dealers for their business performance, industry leadership, and community service. Of the seven nominees from across the country, Richard Reynolds, president of Peach State Truck Centers in Norcross was selected for the honor. Peach State Truck Centers has 11 dealerships and 180 service bays across two states; a massive enterprise that carries seven different truck brands! 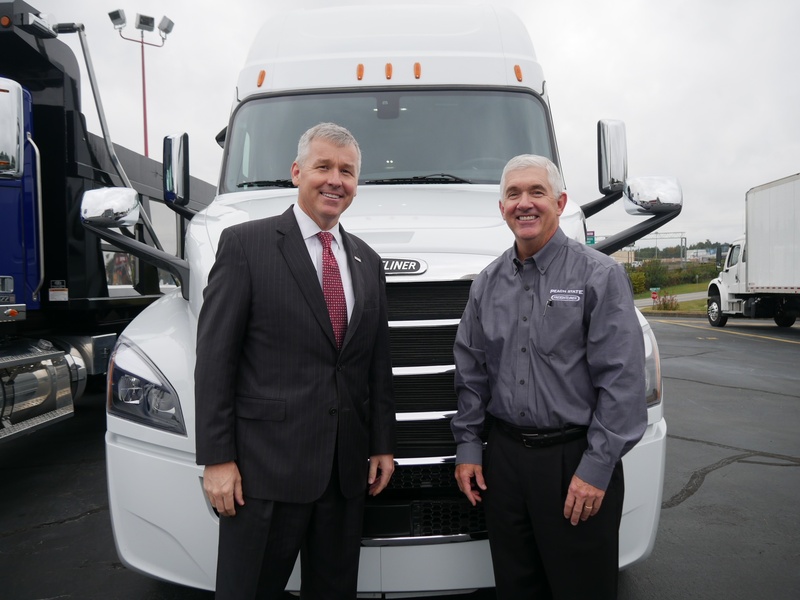 Richard invited me last week to take a ride in a 2019 Freightliner Cascadia and share his story with me about how his business has grown under his leadership and his relationship with his employees, who he credits for helping him become the 2018 Truck Dealer of the Year. While there, we also had a chance to discuss the issues that were currently affecting the industry, mainly the trucker shortage experienced nationwide. This shortage not only delays delivery of goods, but it also drives businesses to increase their prices as the cost of transporting those goods rises. Last Congress, I worked with my colleagues on the House Transportation and Infrastructure Committee to enact H.R. 22, the FAST Act, which authorized the creation of a pilot program to allow those between 18 and 20 years old who have received specified heavy-vehicle driver training while in military service and are sponsored by a participating motor carrier to operate commercial motor vehicles across state lines, a task that is currently prohibited for anyone else under the age of 21. A year after, President Trump announced that the Federal Motor Carrier Safety Administration would move forward with the proposal and implemented the pilot program! Each day we are working to make sure all industries in the United States are provided the opportunity to succeed, and I will continue to find and implement solutions that make that success more achievable. I was shocked to learn that billions of tax dollars are funneled into cruel, deadly experiments on animals every year. With these public funds, countless animals are burned, shocked, starved, poisoned, mutilated, psychologically tormented, and killed in laboratories across the U.S. What happens to animals in laboratories would be considered criminal cruelty to animals if it occurred elsewhere. To waste public money on archaic and unethical animal experiments when superior methods are available is unjustifiable. I urge you to earmark research funds for progressive and relevant clinical and non-animal studies instead of experiments that harm and kill animals. Thank you. I want to establish more firm and stern guidelines/laws towards animal cruelty. I'll find evidence towards major cosmetic industries and the average day of animal abuse that is being disregarded. Animal abuse should be stopped and we should take a better initiative to end it. I appreciate hearing from Ana, Roy, and all of you who have written about this. Like you all, I am totally opposed to all forms of animal cruelty. You might be interested to learn that the State of Georgia has passed a variety of animal welfare laws in the last decade that have provided significant protections to animals, and the federal government has passed laws designed to protect many endangered and threatened animal species as well. However, when it comes to the use of animals in experiments, as Ana discussed, the Animal Welfare Act (AWA) is the only federal law in the United States that regulates the treatment of animals in research, exhibition, transport, and by dealers. While, other laws and policies may include more specific care or species-specific protections, the AWA is the minimum standard that all are held to. Enforced by the U.S. Department of Agriculture (USDA), highly-trained inspectors throughout the United States conduct routine, unannounced inspections of all facilities licensed or registered under the AWA to assess these facilities’ compliance with AWA. According to NIH, “Research projects involving animal models are considered only after a group of scientists from institutions around the world have rigorously evaluated the proposal, and they consider criteria such as the justifications necessitating the use of animals and plans for veterinary care. These are scientists who understand the scientific value of a particular animal model for exploring the biological processes of a health condition and its treatments.” To that end, we must vigorously enforce the AWA and its protections. Please know that I will seek to ensure that those who violate the AWA will be punished accordingly, and I will always work to ensure that we are using non-animal testing measures where practicable. If you live in Forsyth County, you’re no stranger to the success of our local schools, but the hits just seem to keep on coming, so to speak! According to the College and Career Ready Performance Index (CCRPI), the Forsyth County School System had the highest score among metro Atlanta counties in 2018, and the third highest in Georgia! I’ve said it before, but this kind of success doesn’t just happen. It’s the result of a lot of hard work and commitment by students, educators, parents and mentors. If you’re not familiar with the CCRPI, it focuses on how successfully school systems are preparing students – irrespective of grade level – for the next step. So much of education is about ensuring young people are prepared for the opportunities – and challenges – that lie ahead. If we as families and communities are achieving the goal of equipping our students with the necessary tools for whatever comes next, then the future certainly looks bright. We’ve seen just how effective our local school systems have been time and again, but I never grow tired of seeing the hard work recognized. Congratulations, and keep up the great work! CELEBRATING A VIBRANT SEVENTH DISTRICT! The Seventh District is so fortunate to have a wonderfully vibrant and diverse community. We set a remarkable example of what it means to celebrate those things that make us unique and those that bring us together. 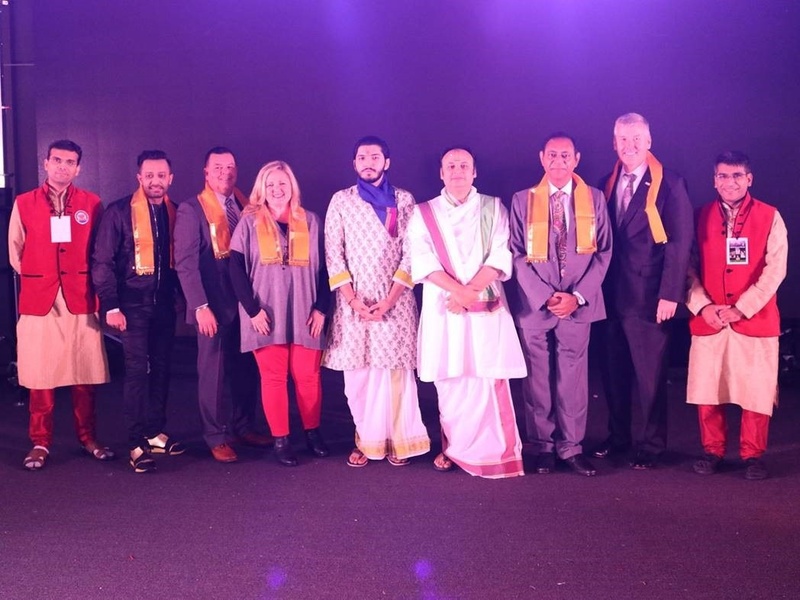 Thanks again to the folks at the Gokuldham Haveli in Buford for inviting me to be with you on your one-year anniversary and Diwali celebration! There may be no greater example of acceptance than making someone feel welcome in your home, place of worship, and close-knit circles. Here at home, we do that wonderfully well irrespective of our varying backgrounds and religions, and I’m very grateful for the graciousness I see and experience on a daily basis. Without a doubt, one of the biggest honors I have in serving as the Seventh District’s Representative in Congress is being able to tell our tale of diversity and success in Washington and beyond. Thank you all for what you do to make it a reality! Tomorrow is Election Day, and while hundreds of thousands of Georgians have already voted, if you haven’t done so yet, I hope that you will. I’ve said it many times before, but it bears repeating; the right to vote is something that Americans have fought and died for, and it is a right that too many people around the world still don’t have. We all have the ability to shape the future of our nation with our votes, and I hope you can find some time tomorrow to make it to your polling place. If you’re not sure where your polling place it, please visit the Georgia Secretary of State’s My Voter Page. You can enter your voter information – first initial, last name, county of residence, and date of birth – and you’ll be provided with all the information you need about where to vote tomorrow. And if you need information about what’s on the ballot, you can go to the Forsyth County Voter Guide or the Gwinnett County Voter Page to find links to your city’s voting resources.